Shared channels offer new opportunities to Slack developers — here’s what it means for you. Previously when two organizations wanted to work together in Slack, they had to rely on guest accounts — and deal with multiple workspace logins — to do it. With today’s beta release of Shared Channels, a new type of channel that connects Slack users from two distinct workspaces, two companies can work together as productively as they work with their own team. For developers, shared channels bring opportunities to build apps that streamline the work companies do with their external clients, partners, contractors, and vendors. Whether you’re building something new or preparing your own app to encounter foreign teams, you can adopt the Conversations API to deliver your app the scalability and performance shared channels call for. Shared channels can be a powerful lever for app discovery. In a shared channel, apps and internal integrations are shared too: if one company installs an app, both companies in a shared channel can use it to simplify their common workflows. If your bot is invoked in a shared channel, others in that channel can send it direct messages. The Conversations API was built to help apps perform well in shared channels. In addition to removing ambiguity around what type of channel your app is participating in (shared, public, or otherwise), the API also allows you to review user history, invite team members, set channel topics, or create new channels, and more. It wraps in performance improvements, like pagination and consolidated endpoints, so your app can better scale in — and out — of a shared channel. You can build an app that solves new use cases specific to cross-company workflows — like handling purchase orders and vendor payments, reviewing and approving proposals, or crafting shared documents. You can build an app to solve a cross-organizational need—like tracking contractor hours. 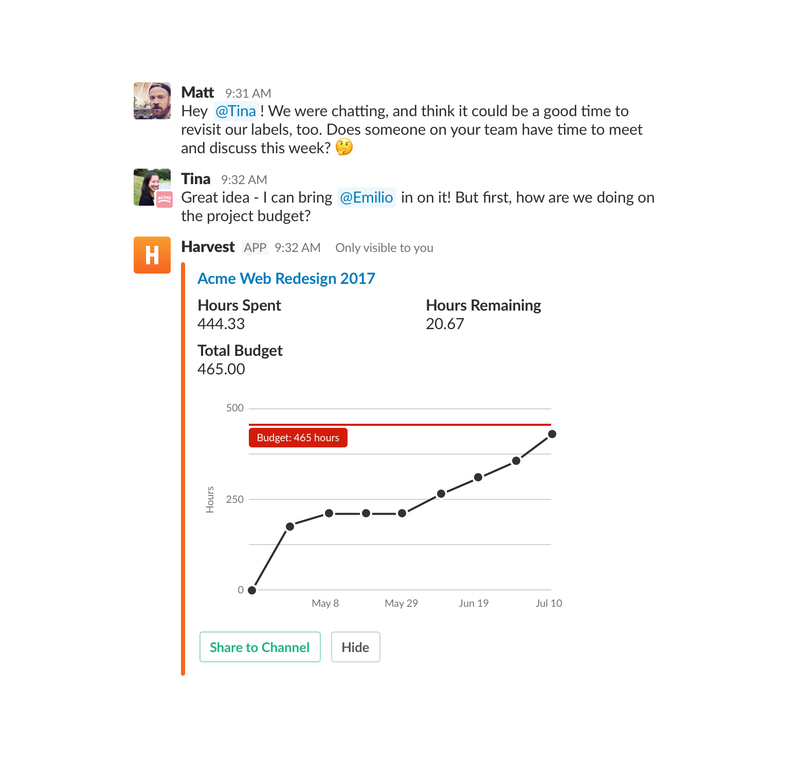 For instance, Harvest’s Slack app simplifies a task common to any contractor relationship: employee time tracking and budgeting. Companies working with outside contractors can use Harvest’s app to start and stop project timers, quickly generate budget reports, or track hours spent on a certain activity, without needing to open a separate tool to do it. If you’re building a new app, you can use our SDKs for Node.js and Python, which have been updated to support the Conversations API. When you’re ready to test your app for shared channels, you can use Steno, a command line utility that allows you to record and replay interactions with Slack’s APIs. Learn more about preparing your app for shared channels, testing apps using Steno, and the Conversations API on our documentation site. 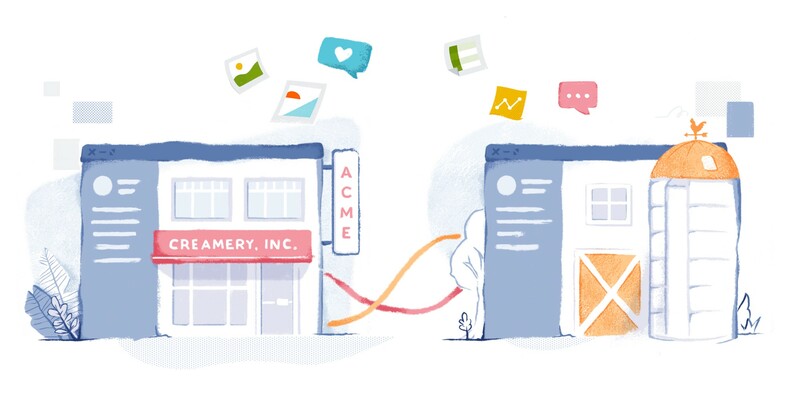 Read about how Slack customers have been using shared channels, or read our documentation to learn how to prepare your app.